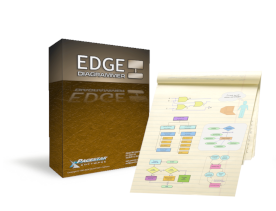 Extension Pack One is a free add-on for EDGE Diagrammer. It includes more symbols, samples, and diagram templates, particularly for business and technical diagrams. You can download and install this extension pack free if you have purchased a license or even if you are just evaluating the free trial version. Diagram template, symbols, and samples for creating ER diagrams of different types. ER diagrams are commonly used to design database systems. Diagram template, symbols, and samples for creating diagrams of logic gate circuits (AND, OR, NOR, NAND gates and so on). Logic gate diagrams are often used in circuit design and in teaching fundamentals of boolean logic to engineers and programmers. Diagram template and sample for creating structure charts. Structure charts aid in the design and documentation of software by identifying argument passing at the procedure level. Diagram template and samples for creating simple data flow diagrams. Data flow diagrams are useful for designing systems, processes, and software. Diagram template, symbols, and sample for creating CCITT standard SDL (Specification and Description Language diagrams. SDL diagrams represent sequences of events on two or more systems that synchronize. A common example is the sequence of steps involved in a phone call. Diagram template, symbols, and sample for creating simple RF block diagrams. RF block diagrams are used in the design of RF and wireless systems. Diagram template, symbols, and sample for diagramming complex systems involving energy flow. This diagramming language was pioneered by Howard T. Odum at University of Florida, Gainesville. DEMO SHEETS: This extension pack includes a number of "demo sheets" containing sample diagram objects of different colors, sizes, and shapes. For example, suppose you wanted to know what size arrowhead to use in a particular diagram. You could guess based on your knowledge of point sizes, how the arrows look on the screen, and how they look when you print them. But this could be a long slow process. A better way is to print out the demo sheet that contains arrowheads of different sizes and choose the one that fits best. there are demo sheets for line widths, figure sizes, text font sizes, line patterns, flow symbols, and more.